Same thing I encountered yesterday while alighting. Reader just no response no matter what I do. Then subsequent commuters tap out also error each time until several tries later. Mine still error so I gave up. Reported claim this morning. Lol. that is with watch or phone? Last edited by Dingding6; 22-04-2018 at 04:37 PM.. Phone. 2 sides of the bus reader also no response. I think this has to do with the backend network..
your phone middle as the reference point, when you do side.....the side "Inside of the Card shape"
Last edited by Dingding6; 22-04-2018 at 05:08 PM..
so i took out my card and scan, don't wanna hold up the line. When i exit, i waited for all crowd to leave and try tapping the watch. not sure if its the watch placement, i wore it purposely on my right wrist to try on this. I tap on the whole watch surface on the reader, top side of the watch, angled the watch, all cannot. You do know that your card and your watch are considered separate cards right? You cannot tap in with a watch and exit with a card and vice versa. I use phone better, higher success rate. Hahas! Just sharing my experience today. Managed to take 3 buses (transfer) in a row without any issue. My iPhone was recognized by the reader, though it took around 1 second. Like one of the previous posters said, I left a gap of around 1-2cm between the back part of the phone and the reader, and it worked. Last edited by Dingding6; 23-04-2018 at 08:58 AM.. The problem is sometime after scanning with no response from reader, iOS will exit the Apple Wallet. Yesterday alighting from bus very paiseh jam up the exit. Imagine have to press power switch, double click home button to activate wallet, finger print, hold near reader again, with everyone glaring at me. I had used the physical mastercard and scanning works just fine. 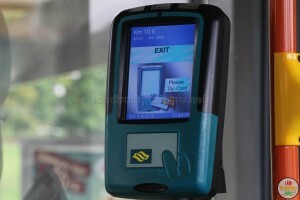 As fast as ezlink, maybe your card itself got some issue that's why slower? "as fast as ezlink" means 0 sec or around half a sec? for me i can feel the diff between ezlink and physical mastercard processing time. u can register ur left/right fingers that u used to double click home button as Touch ID (eg. left thumb). then just 1 step: use your left thumb to double click home button, tap phone. another method also 1 step: make sure your screen is off, put your thumb on the touch id, tap your phone like a card/remote control. (phone and wallet will auto wake up, but need 1 sec longer). Most of the time I managed to tap within the given time before need to reload the mobile wallet.